Anyone else see what went down? Suriya thai has just been reborn at 1532 Howard St btwn 11th & 12th. Talked to Suriya yesterday, and he said they moved due to landlord issues. Who knows? But they have pumpkin curry on the lunch menu–yum! But does the new space boast an adjacent garage door onto which the elephant mural can be also rebirthed? 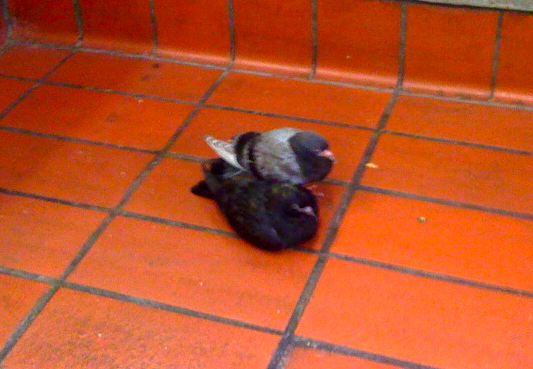 Today BART passengers were busy checking out these young pigeons napping in the 24th St. Mission station. While the picture does not do them complete justice, these rats birds were small and were not bothered by people getting close to them. I was pretty interested as to why I had never seen young pigeons ever before. Apparently adult pigeons feed their babies until they are nearly adult size, so they rarely leave the nest prior to becoming full size. going around the cool kid community is some totally gnarly flu- it could be swine flu, or kangaroo flu or regular flu, who knows. ground zero was a bridez show at el rincon, we think, because everyone was sneaking alcohol in, and sharing drinks and getting sloppy, and so who knows how many flu bugs jumped from person to person. The upshot is anyone who wants to avoid being sick needs to avoid cool kids and there events for at least another week while the virus burns out. Heard that? Stay away from cool kids! Thanks, Aaron!